Become an official sponsor of Proxiblog! Proxiblog continues to grow, reaching more auctioneers, bidders, hobbyists and dealers. Our purpose in buying, selling and writing about coins is to help fund student scholarships, as we have noted in several posts and as appears on top of our rankings. Now we have a method for you to promote your company and fund scholarships at your discretion. Click picture above to expand for details. In the past several months Proxiblog has been approached by major houses and dealers about accepting advertising. We do not. 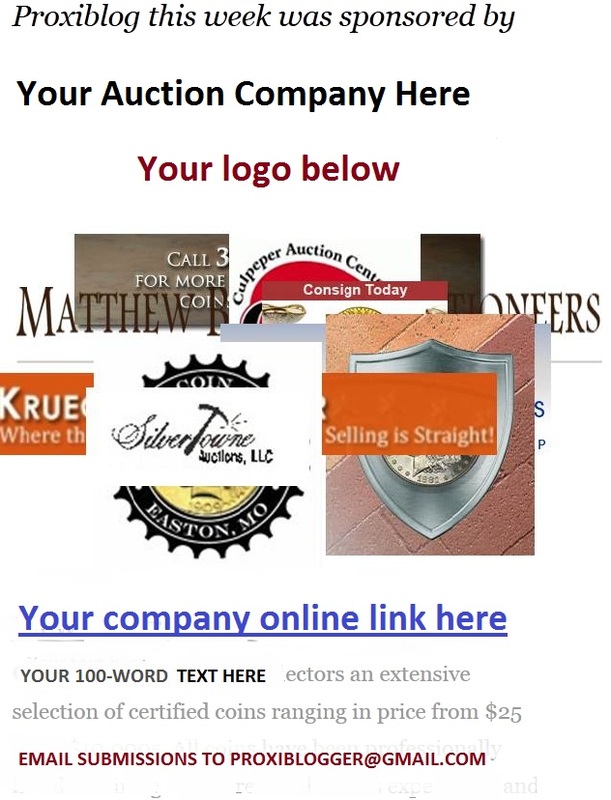 Rather, we have taken a National Public Radio approach with companies sponsoring a week of Proxiblog posts about the online auction business with a post dedicated solely to that company on Friday, running through most of the weekend. On Sunday evening, the post will transfer to our “On the Block” page, remaining in our Proxiblog queue. This way your promotion will remain on Google and other search engines as long as our site remains online. And as all posts, the promotion will also appear in our publication queue, progressing down our main page to the “older posts” archive. We ask that you do not promote a specific auction but the hallmarks of your company, especially in the coin trade. If you have a low buyer’s fee, state that. Fine photography? Always a big draw. Inexpensive shipping? Bidders look for that especially. If your company has been in business for generations, tell us about that. If you’re new to the online auction trade, state that, too. We’d also like as sponsors coin publications and organizations. Dealers welcome, too! A link to your company’s site. A jpeg digital photo of your company logo. A 100-word description of special qualities about your company. We do not charge for such promotion and have the right to decline and/or edit submissions. However, after your promotional sponsorship runs, we ask that you visit our scholarship fund account and make a voluntary tax-deductible donation to ease student debt. Beginning this Friday we will showcase our first sponsor, Great Collections, one of the top online timed auctions in competition with Telerade and Heritage. Thank you for your patronage of Proxibid (the company we cover in this independent blog) and, of course, Proxiblog and its mission to help fund student scholarships at Iowa State University of Science and Technology, the first land-grant institution in the country and home of the world’s first electronic digital computer–an appropriate icon for online commerce. This entry was posted in News, The Block. Bookmark the permalink.